Free Fall Rounding Game! All you need are these game boards and dice. 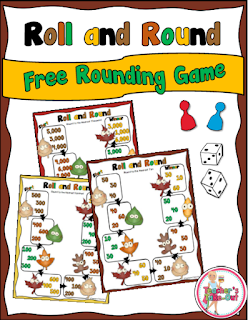 Just print and you are ready to start practicing some rounding. There are 3 game versions included; rounding to tens, hundreds, or thousands. If you are rounding to the nearest ten, you will need two dice. If you are rounding to the nearest hundred, you will need 3 dice, and so on. Players roll and round as they move around the board. The 1st player to the Winner's box is the winner! Click the picture for your freebie!! Need more rounding practice? Try these packs at your math center or small group time. Need some Rounding Resources? Check these Rockin Rounders out!